For 10 years, Loren was editor of the cult nonfiction magazine Morbid Curiosity. She still believes curiosity is a radical, transformative trait. The contributors and contents of Morbid Curiosity magazine can be found here. A collection drawn from the magazine has been published by Scribner. Morbid Curiosity Cures the Blues is available from your local bookstore or from Amazon. Loren’s writing ranges from dark urban fantasy, dystopian science fiction, and morbid erotica to worrisome personal essays and gleefully gloomy travel articles. Her short fiction has appeared in City Slab, Cemetery Dance, Not One of Us, the chapbooks Ashes & Rust and The Paramental Appreciation Society, and in the book Sins of the Sirens: Fourteen Tales of Dark Desire, alongside Maria Alexander, Christa Faust, and Mehitobel Wilson. Magazines like Tail Spins, Unzipped, and Jane have featured her peculiar personal essays. Loren’s travel stories darkened the pages of two Traveler’s Tales books, the anthology Pills, Thrills, Chills, and Heartache: Adventures in the First Person, and Instant City. Her explorations of graveyards manifested monthly for almost four years at Gothic.Net. 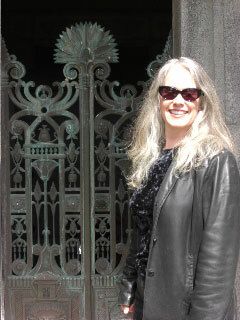 Loren is a member of the Horror Writers Association and the Association for Gravestone Studies. You can find all Gothic.net articles and fiction relating to Loren Rhoads at tag Loren Rhoads.